Do you want a more beautiful smile? At Hyde Park Dental Care we have an array of cosmetic treatments to enhance the appearance of your smile. Create a beautifully white, symmetrical smile with our advanced cosmetic dentistry treatments. Gone are the days of unsightly orthodontic appliances and harsh whitening treatments. Our cosmetic treatments will enhance your smile comfortably with aesthetically pleasing results. At Hyde Park Dental Care we are committed to helping you achieve your desired smile. 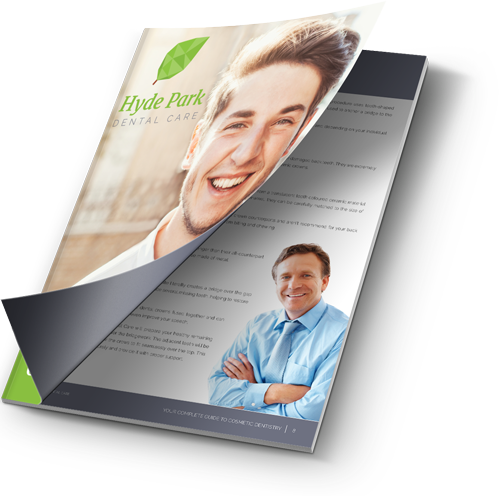 At Hyde Park Dental Care in the Sydney CBD, we go the extra mile to really sit with you and discuss what you want to achieve from your treatment. By understanding your smile concerns, we can work together to create a treatment plan unique to you and provide the result that you wish for. With a choice of composite veneers or porcelain veneers, you are totally in control of just how dramatic your results will be. Porcelain veneers are perfect for those wanting to restore one tooth or transform the teeth in their smile zone, whereas composite veneers are a more conservative approach to enhancing the appearance of your smile. There are many causes of tooth discolouration including lifestyle habits, the foods you eat, certain medications, illnesses and beverages. At Hyde Park Dental Care we are trained to find the source of your tooth discolouration in order to provide the best treatment for more effective results. Not sure about what you want? At Hyde Park Dental Care we offer a FREE 20-minute smile evaluation to discuss your cosmetic dental concerns with Dr Joffe! This is for online enquiries only so book today! We go the extra mile to ensure your smile is healthy and beautiful, and are always happy to answer any questions or concerns you may have. We strive to exceed your expectations with high levels of service combined with gentle dentistry for the optimal experience. By telling you about any associated costs or complications involved prior to your treatment, you can make a fully informed decision. We don’t pressure-sell, instead, we give you time to ask questions so you can make the decision that is best for you.